→Attitude – How’s Yours Doing? Welcome to my Sunday Supplement. I have something slightly different today. There are many things that impact what happens in our lives. A lot of the time we tend feel that the things that do impact us are external and out of our control, but I was reminded today that this is not always true. I try to start my day listening to something motivational. Let’s face it there’s enough negativity on the news these days that we need something to counter-balance it. 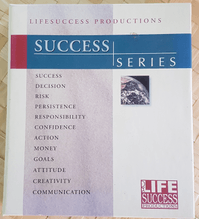 So it was that today I pulled out a series of lessons from Bob Proctor that cover 12 components of a successful life. Today’s lesson was about attitude. We have no control over things that happen to us but we do have control over how we deal with them. We have a choice over how we deal with things in our lives. There are two ways that we can deal with the challenges that face us in life. We can react or respond. When we React – we lose. When we Respond – we win. We live in a world of duality. There are two sides to everything. We can’t have an up without there being a down. Similarly, we can’t have a right without a left, an in without an out, good without bad, positive without negative. It’s one of the fundamental laws of nature. Ralph Waldo Emmerson said that the law of cause and effect was the law of laws. He also said that a person becomes what he (she) thinks about all day long. The results we achieve in life are nothing more than a result of our thoughts, feelings and actions. When we react to a situation, we usually do so in a negative way. When we respond we do so in a positive way. The term respond suggests that a level of consideration has gone into how we deal with a situation, whereas the term react tends to suggest that a more immediate, unthinking action has taken place. Taking this a little further then, it follows that we can either respond positively or negatively to a situation that occurs in our lives. However, and this is crucially important, the conscious mind can only think of one side or the other – positive or negative. It is not capable of thinking of two things at once, despite what many of us think (multi-tasking and all that). So our job is to develop a positive attitude about all areas of our lives – not an easy task I might add. As humans we have an easier time listing all of the things we don’t like about a situation than we do the good things. That being the case, it’s OK to start with that list of bad things first. Then, alongside of it, we can list the opposite of the bad thing. That then becomes our list of good things. This takes a bit of practice. In fact, I’d say it’s almost a daily exercise that we need to build into our lives. When we’re leading busy lives, as most of us are, it’s not easy to do this but well worth the effort. Those people around us that appear to achieve success in everything they do, are aware of the negative side of things but choose to focus on the positive. If we think negative thoughts we will receive negative results. Our attitude has such a profound impact on what we achieve in life that it should be taught in schools, but sadly it isn’t. It it was the whole world would be a better place for everyone. Maintaining a healthy positive attitude is not an easy task. If you are successfully in control of your attitude at all times you are one of a very small select group of individuals. The rest of us have to work on it, but the more we work on it the better we’ll get. We all have a choice. Remember, we can only think of one side of the equation at a time so we should practice thinking of the positive side. The more we practice this the sooner we’ll become a master at it. Bob relates a true story from his own life that proves the impact of how our thinking impacts our outcomes. He had a friend of the family who’s business was going through a rough time and that was affecting his friend’s attitude. He was taking out on his family the problems he was having in his business. While Bob was visiting with them his friend explained that things were so bad that he didn’t have the money to pay the wages at the end of the month and would likely have to lay people off and close the business. Bob took out a cheque book from an old Canadian bank account and signed the bottom of a cheque, telling his friend that he should only use the cheque if he absolutely had to, but it was there if he needed it. His friend’s attitude changed like night becomes day. He became relaxed, happy and the stress just melted away. Some time later when Bob was again visiting in the area, his friend met up with him and gave Bob back the cheque unused. He thanked Bob saying that it was a wonderful gesture but that he didn’t need to cash it. “That’s good”, said Bob, “because there hasn’t been any money in that account for years”. Bob’s friend thought that the circumstances had changed but in reality all that had changed was his attitude. Everything happens by law. We are spiritual beings that can tap into the positive vibrations that successful people make a habit of doing. Let’s make it a daily practice routine in all of our lives.